The DCS Model 90 proportional integral derivative (PID) Temperature Controller is the latest evolution in the Multistat™ series of PID controls. Designed for the global equipment market, the Model 90 can operate from direct or alternating current power mains from 80 to 280 volts, so it can be used anywhere in the world without modification or adjustment. 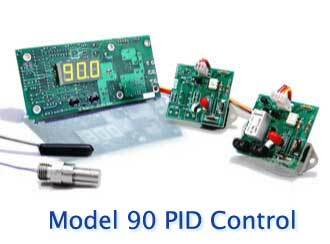 This single-channel PID controller will accurately control single electrical loads of up to 15 Amps. All of the control electronics and the user interface are built on a compact (13.5 x 6 cm) circuit board for easy mounting and clear display. Large bright LED digits make the display easy to read from across the room. Load power is controlled by a second smaller (4 x 5 cm) power module that can be located in close proximity to the output. This eliminates high current wiring having to be run to the front control panel. This power module is connected to the main circuit board with a low voltage cable. The extensive options available for the Model 90 make it easy to differentiate similar models in your equipment portfolio, as well as to stand apart from the competition. Options such as an audible alarm, ‘heater activated’ LED annunciator, or a timer can be easily installed and uniquely cataloged for your products. All LED displays are standard in red, yellow and green (please consult the factory if other colors are desired). The optional RS-232 interface feature can provide full remote operation of the controller. Data logging at a user specified interval is also supported. Multiple control and sensor configurations are easily supported. For direct temperature control the Model 90 can be used with economical IC sensors (for operation below 100 °C), RTDs, or type ‘J’ and ‘K’ thermocouples. A direct voltage (5 volts Max) input configuration is also available for control of parameters measured by external sensors such as relative humidity or CO2. Two Dry Contacts Field-Configurable as NO or NC.